Ever since I started using my study needs pre-supposed that I was able to input English, Deutsch (German) and 日本語 (Japanese). Lately, 中文* (Chinese) has been added to this list as well. Recently Ubuntu 10.10 (Codename “Moody Mastodon” – or was it “Maverick Merkat”?) was released and since I usually test Beta releases, I went through the usual installation routine including additional software installations at the end. At the moment, these installations include mnemosye, anki, vlc, audio cd extractor and torcs. Interestingly enough, GIMP seems to be back by default. Lanugage customizations include adding German, Japanese and Simplified Chinese. After SCIM was deprecated, I switched to IBus as Input Method (either seems to work, so I don’t mind). 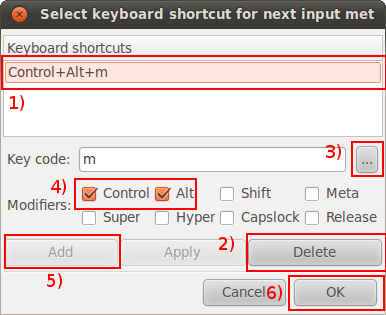 One thing that I never got to work so far was the combination for the next input method, which is Alt-Shift_L by default. I suspect (but don’t have any conclusive evidence) this is due to this ominous Shift_L key. Is this supposed the left shift key? 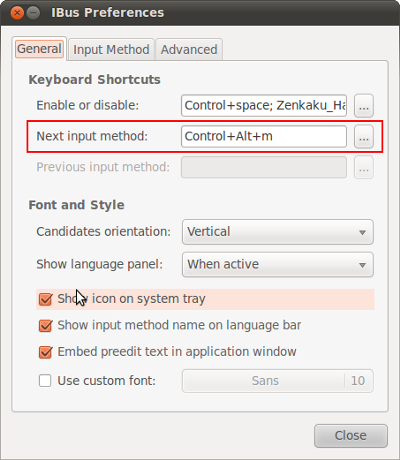 4) If your favourite modifier have not been added, check them (by the way, the “Windows” key or “Super” key as it’s called on Linux might work or not depending on your distro. Also: text the key combination before specifying it e.g. Ctrl+Alt+L will lock your screen which takes precedence over IBus key combinations. 6) Close the window by clicking on OK.
Start an application e.g. 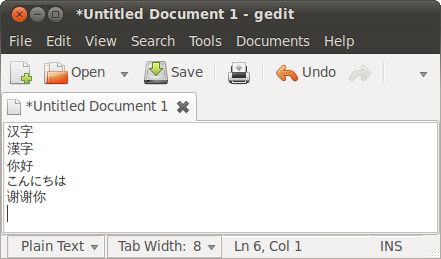 OpenOffice Writer or Gedit, kick off IBus by pressing Ctrl+Space and input cryptic writing at your heart’s desire. *Did you think it was 汉语? I think that refers more to the spoken language. Correct me if I’m wrong. Heck, even both might be correct. You are currently browsing the Musings From Beyond blog archives for September, 2010.